“I don’t much care where – ,” said Alice. 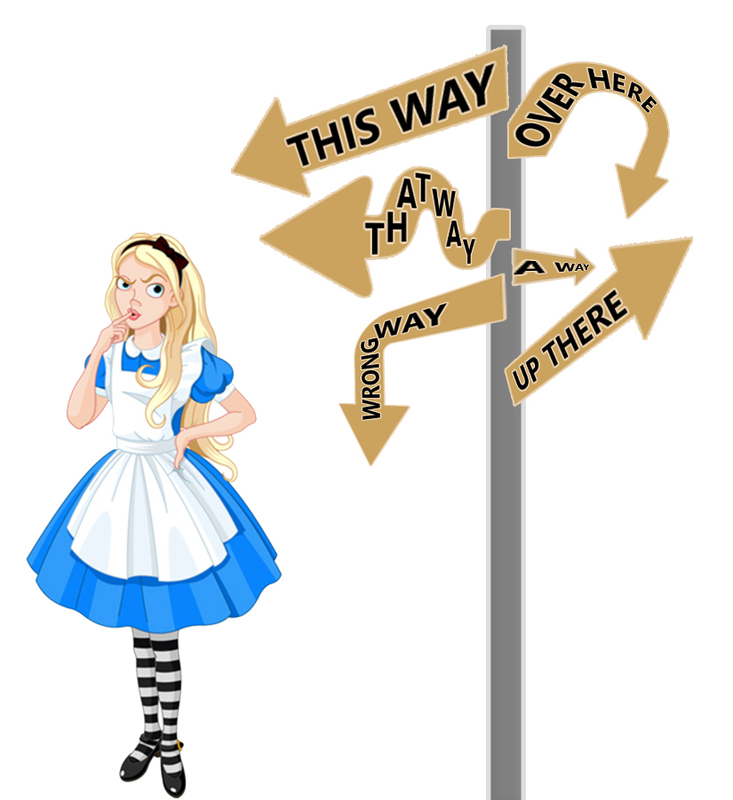 Unlike Alice’s aimless wandering in Wonderland, when visitors arrive at your school website, they usually have an end-goal in mind. And even if they aren’t sure where they want to end up, they are certainly hoping you’ll be more helpful than the Cheshire Cat in guiding them to a destination. What’s the secret to guiding your audience along a path in your school website? The answer: The best website copywriting has a destination in mind. You know what your school has a lot to offer, but do others know it too? Does your website tell your school’s story in a way that’s friendly and easy to read? Or do people arrive at your website and run the other way because it’s confusing or overwhelming? With almost 15 years of experience, we’ve learned a few important lessons about writing school websites that we’re happy to share with you. Reach the right audiences with the right messages at the right time. Differentiate your school from the competition by giving visitors reasons to believe in your story. Claim your expertise with confidence. Persuade audiences to believe you are the best choice for them. When your website copy accomplishes these things, you will guide your audience along the correct pathways to arrive at their end-goal, whether it’s making that decision to enroll or finding the lunch menu. Defining where you have the most authority—where you have experienced the most success—is the “sweet spot” you’ll use to direct the writing throughout your website. Knowing who you are puts you in a position to bring your brand to life. If you are preparing students for entrance into prestigious universities (or whatever your sweet spot is), say it. Once you have a plan, you’re on your way. Use well-thought-out headlines and subheadings. Where did your eyes go first on this page? I’m willing to bet that you automatically skimmed the heading and the subheadings to find out what we were going to address in this blog post. Well-thought-out headlines and subheadings will present information quickly and allow readers to decide if they want to continue for more. Think of them as signposts to guide your audience on their journey. Summarize your key points into a paragraph. It only takes a few sentences. Get to the point quickly. In our fast-paced world, less is very often more. Be specific about what you have to offer. Include focus keywords. Be clear. Don’t try too hard to be creative—choose clear over clever. Emotionally hook your reader from the beginning by letting them know what’s in it for them. I’ll bet the next thing you saw were the bullets at the top of the page. See how dividing the information into easy to scan snippets makes for a fast read? We live in a get-it-now society, and unless we’re truly invested and interested in what we’re reading, after a few seconds, we’re ready to move on. Make the information easy to scan and find. Use bullets instead of long text paragraphs to make your points, and move on. Educating the next generation takes a group effort—educators, parents, community members, business owners, students, etc.—so be sure your language is inclusive and friendly—not cold and uninviting. The use of passive voice instead of the friendly, active voice, makes you sound a bit superior, and unless that’s the feeling you intend to convey, keep it friendly. Let’s make some comparisons. Consider the statements below. How would you prefer to be addressed by your child’s school? Riding the bus is a privilege, not a right. Students MUST adhere to all rules for their own safety as well as for the safety of others. Please remember that bus riding a privilege, not a right. For our students’ safety as well as the safety of others, we expect all students to adhere to the rules. It’s a subtle and simple difference, but there is a difference. My mother used to tell me, “It’s not what you say; it’s how you say it.” Consider your intentions toward your audiences when you write. Unless you mean to be extremely stern (which might be the case in some areas), making the effort to be friendly in your website writing will go a long way. Your website is the “hello,” not the conversation. Including every bit of information on your website that a serious inquirer might need is not possible, nor is it necessary or desirable. Remember, you’re trying to lead your audience along a desired path. An informative yet friendly and simple website will whet the reader’s appetite, and a good call to action—apply, inquire, call us, etc.—will allow you to connect with and reel in those who are seriously interested in what you have to offer. So, why is it important again? Your students work hard, and their parents are supportive. Your community is involved. Your teachers dedicate long hours to ensure their methods and skills are up to date so they can help their students master difficult concepts. Your district spends serious resources to ensure your teachers are trained and your classrooms are state-of-the-art. You are amazing, and you’re in competition with other public, charter, and private schools in your area. It’s high time to effectively get the word out. Your website offers a window into this complicated balancing act in the world of education. Website copy writing is the best way to tell your school’s story clearly and concisely. It helps you not only market your school but lead your audience on a journey to help them arrive at the important information they need. Follow these rules on every page of your website, and you’ll have a well-written content for your school website that will be one of your most effective marketing tools. Of course, if you’re still uncomfortable with it, hiring a professional school website copywriter is another option. School Webmasters provides professional copywriting services to schools so let us help you out. Just give us a call.